Melt butter in a saucepan on medium heat. Add minced garlic on medium heat. Once garlic is browned, remove from heat and add crumbled feta. Stir until mixture is like a paste. Slice chicken breasts in half. 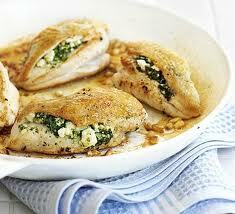 Add a spoonful of garlic feta mixture and spinach in the middle of breasts. Spread a spoonful of garlic feta mixture on the top of the breasts and sprinkle with salt and pepper. Use a wooden toothpick to hold the chicken together. Place on baking sheet and bake in the oven at 350F until chicken is fully cooked.